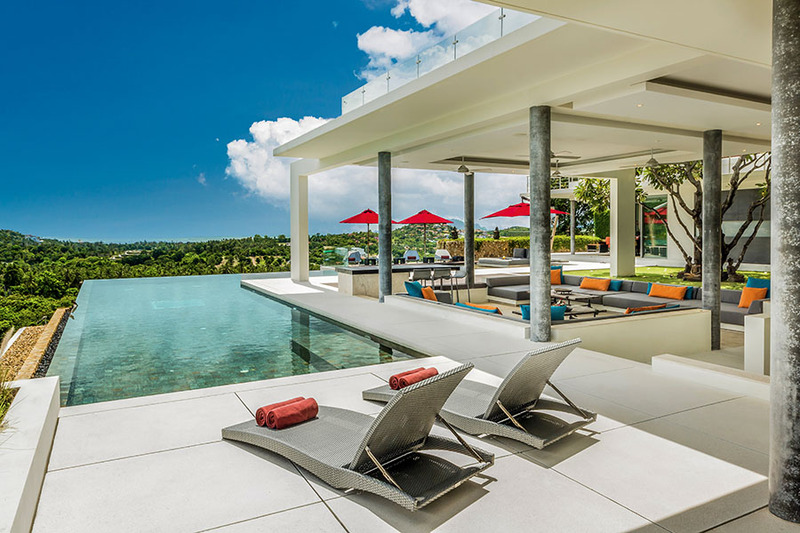 Villa Sangkachai is a spacious, luxury 4-bedroom villa in Koh Samui, one of Thailand’s most picturesque islands. It can comfortably accommodate up to eight guests and is the perfect choice for a fun-filled family vacation or a romantic getaway. Each of the Villa’s four sophisticated suites is tastefully decorated in a clean, contemporary style and are furnished with king sized beds, high-quality linen, a flat screen television and ceiling fans.The suites’ sleek, modern bathrooms also feature deep soaking tubs, separate showers and his and her vanities. Each suite also backs onto a wrap around terrace which offers phenomenal sea and pool views. One of the villa’s highlights is its infinity pool that offers spectacular views of the beaches below. The poolside terrace is also furnished with a plush day bed, which guests can sunbathe on or read a book. The villa also boasts an outdoor, uncover lounge, which is the perfect space for guests to congregate and relax together. No matter where guests choose to relax, they can also take advantage of the villa’s complimentary WiFi. This luxury villa also boasts a state of the art cinema, with plush couches and entertainment area, equipped with a pool table and a modern gym. If guests are yoga enthusiasts, the on-site manager can also arrange for a professional yoga guru to lead a relaxing, rejuvenating yoga session. Guests after a bit of extra pampering can also request the services of a traditional Thai masseuse, who is proficient in a wide array of traditional and modern Thai massages. Better yet, guests are catered to by the on-site manager and a personal chef, who can personalize traditional gourmet Thai meals to suit each guest’s individual tastes. The villa also features a grassed rooftop area, complete with its own barbecue grill, where guests can enjoy the balmy weather and informal meals. Amazing villa. Fantastic staff. Exceptional view. Perfect atmosphere. Super delicious food. What else could we ask for? To return again soon! A small but incredibly luxurious villa with stunning 5-star facilities and stunning view. My family and friends enjoyed our stay so much that we don't want to leave. The staff service is impeccable. Thank you everyone for making us feel like royalty. We are already planning our return. See you soon! We were skeptical of booking this villa due to the warning of the construction close to it. But we love the design so much that we still booked it anyway. To our surprise, it absolutely exceeded our expectations. We were greeted by Jah, the manager with all the staff wearing warm welcome smiles. Then I asked where the construction is. It was way behind and I could not really see it nor feel it. Looking at the beautiful ocean and island views, just make all the everything perfect. We are definitely coming back here and will book again for our next visit. It’s the best vacation ever. It’s difficult to explain why, but I’ll give few reasons. The staff treated us like Kings and Queens. The view is simply stunning. You can see both the ocean and the green mountains of Koh Samui. The food was delicious and healthy and done as we requested. We did not want to leave the villa – it’s the saddest part. We are all looking forward to return. Thank you to everyone at Villa Sangkachai!! !